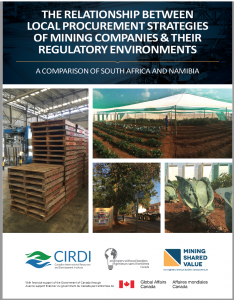 This project examines the local procurement regulatory frameworks of South Africa and Namibia and the extent to which the local procurement strategies of the mining companies that operate within those countries align with and are affected by these frameworks. Research also identified common factors that influence mining companies as they create local procurement strategies. Report authors: MSV (Emily Nickerson, Jeff Geipel and Harry James). Research methods and data collection: MSV (Kanwal Dewan and Emily Nickerson), SEF (Suzette McFaul, Spencer Durant and Javier Nava) and UBC (Dirk van Zyl and Mario Ramirez). Lisez le résumé en français.